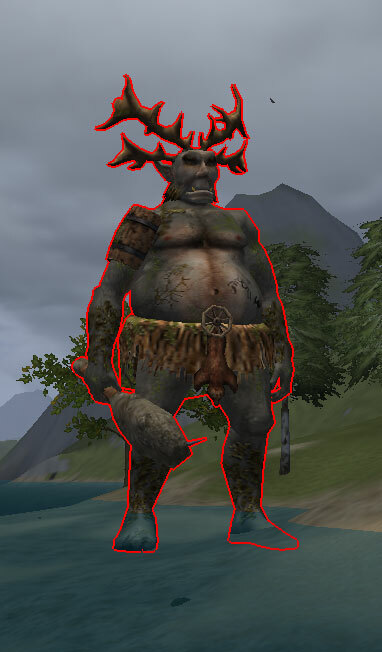 Wurm Online has this concept of uniques, which are kind of like world bosses. Only one unique can exist in a server at a time and they require a large group of players to kill. It used to be that uniques would spawn once on a server and once they were killed, they were gone forever. Recently the Wurm dev team decided to allow them respawn occasionally. This way, if you missed out on killing one on your server, you’d still have a chance in the future. Since I had been on Independence since I began playing Wurm (its uniques had been killed off years before I started) and I had never been to the opening of a new server, I had never seen a unique. So you imagine our awe when The Boyfriend and I came across the Forest Giant when we were first exploring Xanadu. Yes, that is a cart wheel he’s using for a belt buckle. When we heard a few days later that someone was scheduling a raid to kill it, we wanted in on it, just for the experience. On June 21, we arrived at the specified location somewhere on the south coast of Xanadu. All I remember is that it was a long boat ride and I pissed off that they had moved the raid time up by half an hour AFTER they changed the location because the giant had moved. It turns out that it didn’t really matter in the end. They had lost track of the giant so everyone stood around waiting for an hour. Once he was located, it took another hour to move everyone to his location and get them prepped. Why everyone hadn’t prepped in the previous hour, I’m not sure. And during the prep time…the giant was lost again when he raced up over a mountain and disappeared from view. Another hour was spent searching for him once again. Finally he was found and kited all the way back to the main group. Slaying the giant took about 6 minutes to do. I recorded the fight but after looking at it later, I realized it’s not very exciting to watch. I had to stand so close to be able to hit him that all you can see is part of his leg or the wonderful view up his loincloth. Thank goodness he’s not anatomically correct. I think you will agree that seeing that once is more than enough. If you would still like to watch the slaying, someone else posted a video of it on Youtube. Our rewards for helping kill him were the “Giantslayer” title and blood, which was used to make a potion of woodcutting for each of us. The potions can be applied to tools so you get higher quality materials when you use that tool. So while this adventure began with frustration, we were happy to get the titles and our potions. It was worth the trip in the end. The Boyfriend and I found out about the raid on the red dragon very late. We had just logged in when someone had mentioned they were heading to it then. The start was in 2 hours and was in the northwest coast of the server, while we’re located on the mid-east. There was a very slim chance that we’d get there in time but we decided to try anyways. Unfortunately, we did not make it in time. I was able to bring an alt there who happened to be close by so I recorded the fight. And this time I wasn’t fighting, so I was able to stand back and get a better view of the battle. So in the end, we missed out on the “Dragonslayer” title and some more potions, but there will always be a next time.